Light can bend around edges. Light bends when it passes around an edge or through a slit. This bending is called diffraction. 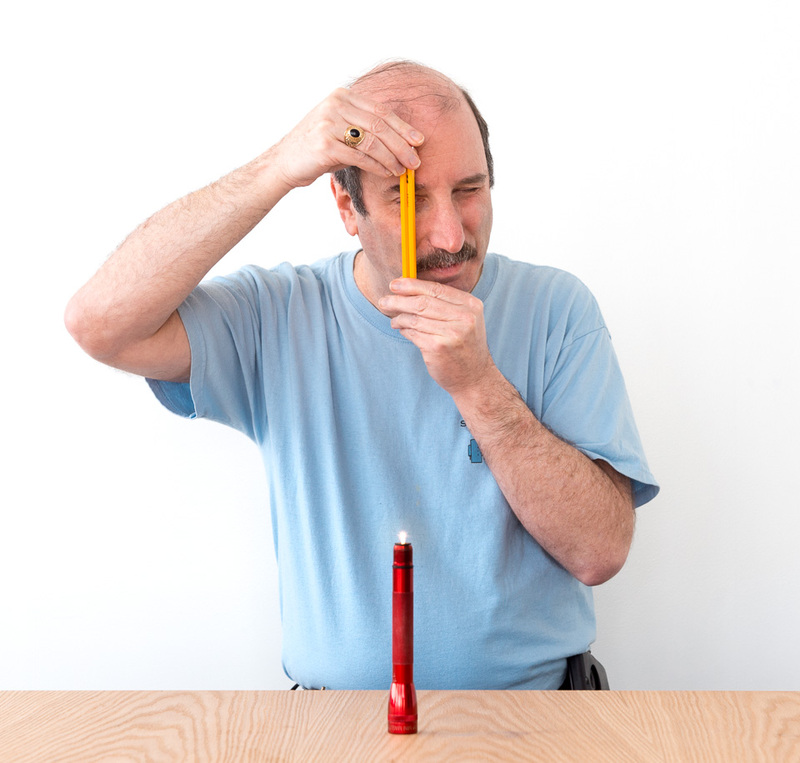 You can easily demonstrate diffraction using a candle or a small bright flashlight bulb and a slit made with two pencils. The diffraction pattern—the pattern of dark and light created when light bends around an edge or edges—shows that light has wavelike properties. Light the candle or, if you are using a Mini Maglite, unscrew the top of the flashlight. The tiny lamp will come on and shine brightly. CAUTION: if you are using an LED Mini Maglite, be sure it is set to dim before unscrewing the top of the flashlight. Avoid staring directly at the light for a long period of time. Wrap one layer of tape around the top of one of the pencils, just below the eraser. Place the light on a stable surface at least one arm’s length away from you. Hold up the two pencils, side by side, with the erasers at the top. The tape wrapped around one pencil should keep the pencils slightly apart, forming a thin slit between them, just below the tape. Hold both pencils close to one eye (about 1 inch [2.5 cm] away) and look at the light source through the slit between the pencils. Squeeze the pencils together, making the slit smaller. Notice that there is a line of light perpendicular to the slit. While looking through the slit, rotate the pencils until they are horizontal, and notice that the line of light becomes vertical. If you look closely you may see that the line is composed of tiny blobs of light. 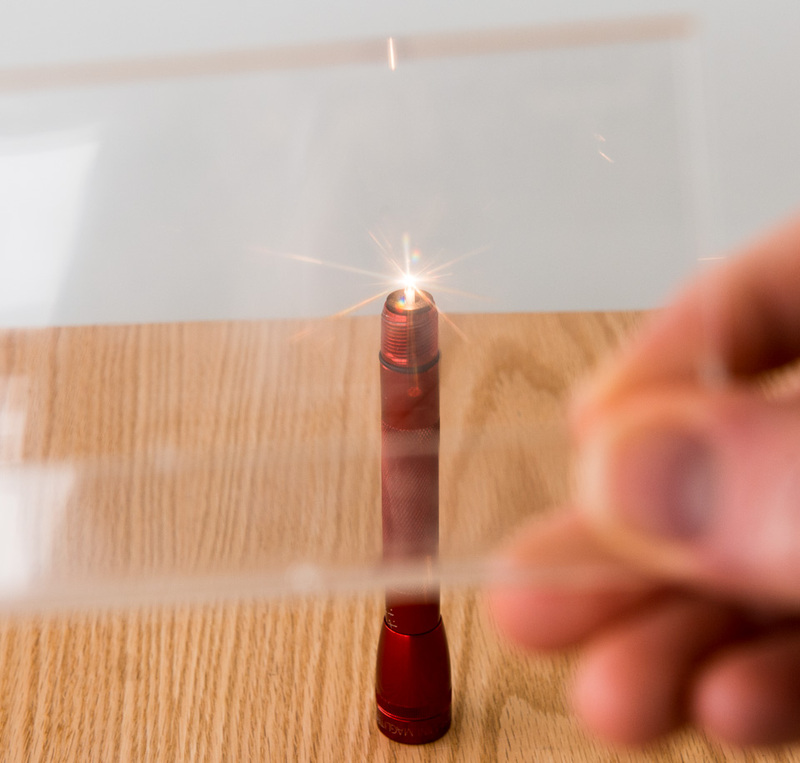 As you squeeze the slit together, the blobs of light grow larger and spread apart, moving away from the central light source and becoming easier to see. Notice that the blobs have blue and red edges and that the blue edges are closer to the light source. Stretch a hair tight and hold it about 1 inch (2.5 cm) from your eye. Move the hair until it is between your eye and the light source, and notice that the light is spread into a line of blobs by the hair, just as it was by the slit. Rotate the hair and watch the line of blobs rotate. Look at the light through a piece of cloth, a feather, a diffraction grating, or a piece of metal screen. Rotate each object while you look through it. The black bands between the blobs of light show that a wave is associated with the light. The light waves that go through the slit spread out, overlap, and add together, producing the diffraction pattern you see. Where the crest of one wave overlaps with the crest of another wave, the two waves combine to make a bigger wave, and you see a bright blob of light. Where the trough of one wave overlaps with the crest of another wave, the waves cancel each other out, and you see a dark band. The angle at which the light bends is proportional to the wavelength of the light. Red light, for instance, has a longer wavelength than blue light, so it bends more than blue light does. This different amount of bending gives the blobs their colored edges: blue on the inside, red on the outside. The narrower the slit, the more the light spreads out. In fact, the angle between two adjacent dark bands in the diffraction pattern is inversely proportional to the width of the slit. Thin objects, such as a strand of hair, also diffract light. Light that passes around the hair spreads out, overlaps, and produces a diffraction pattern. Cloth and feathers, which are both made up of many smaller, thinner parts, produce complicated diffraction patterns. In a dimly lit room, look at a Mini Maglite bulb with one eye (a candle will not work). Notice the lines of light radiating out from the light source, like the seeds radiating out from the center of a dandelion. How can you find the origin of these lines? Rotate the light source and notice that the lines of light do not rotate. Rotate your head and notice that the lines do rotate. Hold your hand or an index card in front of your eye so that it doesn’t quite block your view of the light source (click to enlarge diagram below). Notice that you still see a full circle of lines radiating out from the light source. The effect actually happens in your eye, as lines of light are spread out onto your retina by imperfections in the tissues of your cornea. Shadows made with laser light have light and dark bands.